There are so many perennial Salvias which give joy and colour to any perennial planting scheme. One of my favourites is the blue spiked variety which I think is called Salvia superbum. 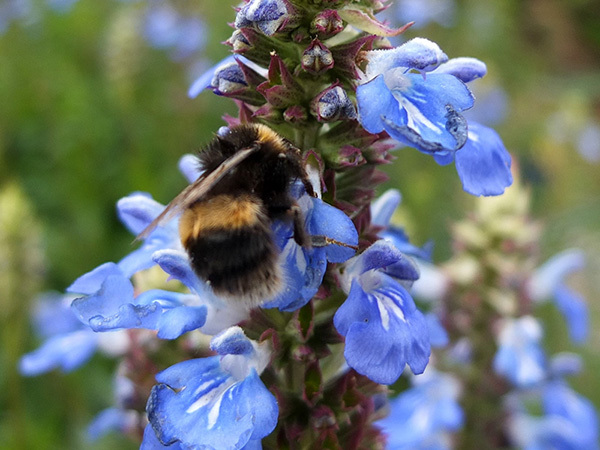 Blue is such a great colour in the garden, and the bees love the Salvia flowers. Blue may be their favourite colour, as it is mine. This particular salvia is perfect to be near the front of the garden border, as its flowers are rarely taller than knee-high. Some years, if I cut Salvia Superbum back at the right time, I can get a complete new flowering in autumn - but I can't ever guarantee this. My most favourite patch of this salvia is in the house garden by the bay window. 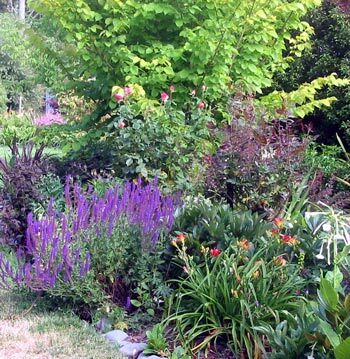 It has Mary Roses, a low growing penstemon, and a beautiful copper-red carex for company. Salvia superbum is easily grown from cuttings, or from stems removed carefully from the roots. It's best in the sun, obviously. I could be wrong, but mine doesn't stay in full flower for very long. Salvias are a huge genus, and include annual, biennial, or perennial herbs, and woody 'subshrubs' (thanks, Wikipedia). 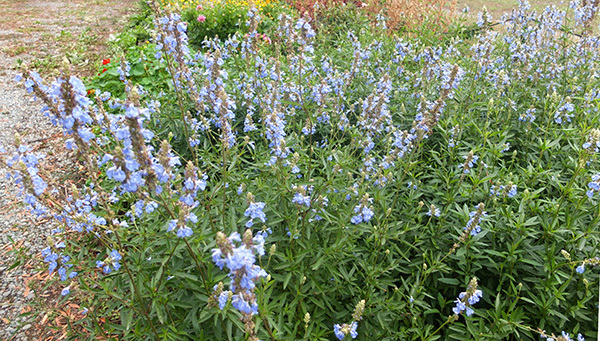 I also grow large swathes of the late summer flowering Salvia uligosa. The flowers are always covered in bumble and honey bees, sharing these precious food sources. 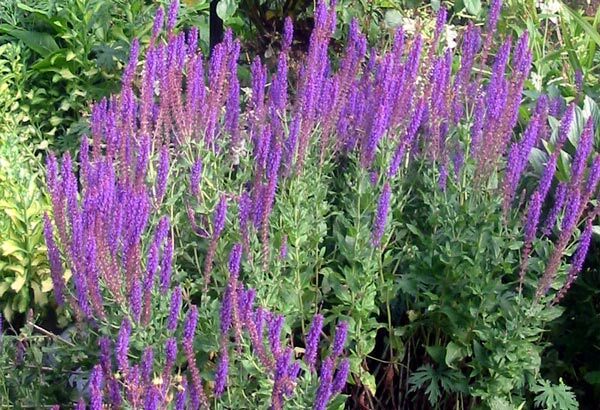 This salvia spreads like a mint does, with root runners stretching far and wide. It needs adequate water, and in my garden can be blown down in the wind. Bumble Bee on Salvia uligosa. But it flowers from late summer well into autumn, and provides food for the bees that buzz around my garden. Later in the autumn, before the frosts, the Salvia leucantha shrublets will be in flower. These are a purple-blue, and the colour is much appreciated late in the season.